Birthday violinists in October include SUZUKI Shin’ichi 鈴木鎮一 (1898-1998) on 17 October, Midori (b. 1971, known in Japan as GOTÔ Midori 五嶋 みどり) on 25 October and TAKEZAWA Kyôko 竹澤恭子 (b. 1966) on 30 October. 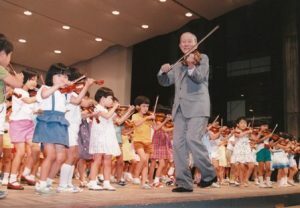 Suzuki Shin’ichi, is of course, best known for his development the “mother tongue” method of violin teaching, also known in Japan as sainô kyoiku 才能教育 (”talent education”). The Japanese only started calling it “Suzuki mesôdo” スズキ・メソード after Suzuki’s method became famous abroad. TAKEZAWA Kyôko 竹澤恭子 is one of many violinists who initially studied with the Suzuki Method, starting at the age of three. In fact, she received her first violin for her third birthday. A few days later, on 2 November, she had her first lesson, with YAMAMURA Shôichi 山村晶一. At the age of six she became one of the young musicians to travel abroad with a group of Suzuki children. She has written about her experience with the Suzuki Method here (in Japanese). Later she studied at Juilliard with Dorothy DeLay and KAWASAKI Masao 川崎雅夫. Since then Takezawa has enjoyed a successful performing career both in Japan and abroad as a soloist and chamber musician. A former winner of international competitions, she now herself sits on jurys: this month she will be on the jury of the International Henryk Wieniawski Violin Competition. Read more about these and other violinists in Not by Love Alone!